It’s hard to imagine a world without technology. No internet, tablets, smartphones or laptops. While many of us do remember the days without these tools, Generation Z hasn’t known a world without having technology at their fingertips. The question is, are all these gadgets, resources and a constant connection of being ‘always on’ helpful or hurtful? And what comes with all this connectivity? Can we focus on what is in front of us or are the notifications on our devices all too distracting? 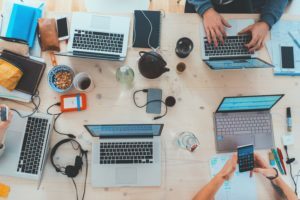 There are pros and cons to this connectivity, but when used strategically and with planning this connection can be used to effectively deliver meaningful messages and content to your businesses’ target. As marketers, when developing marketing plans with a focus on content, we make sure to ask ourselves, with all the choices our clients have to reach their target, and knowing how distracted consumers can be, where should their message be placed and how do we make it engaging? As you create and develop your content, here are a few things to keep in mind. Keep your message clear and focused. Is the takeaway clearly stated? Use videos and imagery effectively. Will the content catch my reader’s eye? If it’s important, repeat it. What are the 1-3 channels where I should distribute my message? With shorter attention spans and a constant influx of information, we find that crafting content that tells a story is more likely to be read and engaged with than content that simply exists.